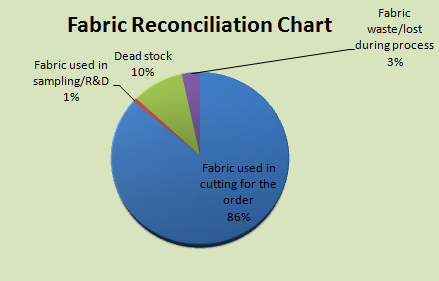 Fabric reconciliation is a process that is used to do fabric analysis. I mean how the total purchased fabric is used by a factory. What percentage of the fabric is actually used to make garments, what percentage of the purchased fabric is left after shipment as dead stock, and how much fabric is lost as wastage. Fabric usage analysis is important because it cost 50-85% of total garment cost. You can plan for saving fabric in future orders based on the current fabric usage analysis. This analysis also help factory to stop unnecessary use of fabric and make each concerned department responsible for accounting of fabrics usage. How to Make Fabric Reconciliation Report? There may be various scenario of fabric status like having stock of fabric and using stock fabric for current order, same fabric is used for multiple orders. 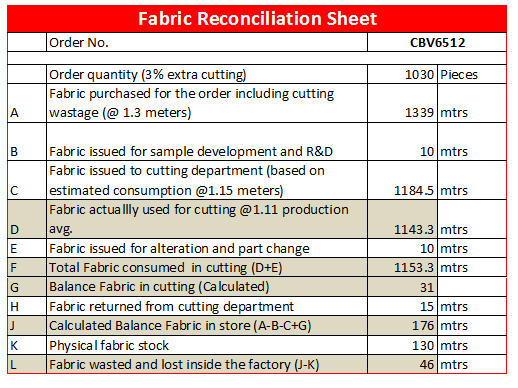 In the article, I will show you fabric reconciliation process against an order and I assume that factory had purchase fresh fabric for the order. Calculation of fabric usage in various processes and balance fabric returned to fabric store. Track following information against each order. 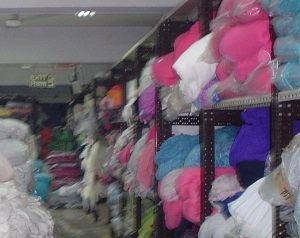 Most of the information will be available in fabric store and cutting department. Fabric purchased for the order. (In case you use stock fabric for an order, add those fabric purchased fabric). Fabric store is responsible to keeping record of fabric issue/receiving against order no. I have made an example sheet for fabric reconciliation. See the below table. Calculations are shown inside the table. You can prepare your own data collection and fabric analysis sheet based this example. The above example is given for woven fabric.Same thing can be done for knits fabrics also. You need to change the unit of measure from meters to Kgs. Based on the above data a brief analysis is done on the four parameters. The percentage figures are not showing any real factory data, it is used only for an example of fabric analysis process. Do you think this is an useful article? Share this to those who really need this one.